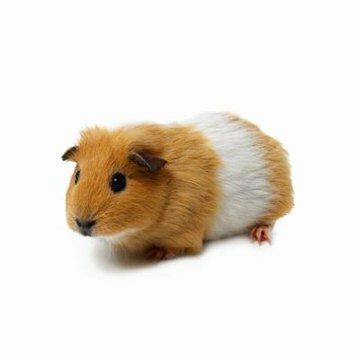 A guinea pig can be a delightful companion, but before she gets to know you, she can also be skittish and shy. Help her come out of her shell by making her a cozy, cuddly sack to hide out and snuggle up in. Lined with fleece, your guinea pig's little sack will be warm and comfortable. It's the ideal place for a cavy to hide in and feel secure. Keeping your piggy's sack clean is easy; just toss it in the washing machine. Make several sacks for your guinea pig so that she's never without one on laundry day. Cut both the fleece and the cotton material so that they measure 12 inches by 14 inches. Fold the cotton material in half so that the 12-inch sides meet, making a doubled-over piece that measures 12 by 7 inches. The wrong side of the material should be on the outside. Sew a 1/2-inch seam along the 12-inch side of the cotton material with the sewing machine. Turn the cotton sack right side out. Fold the fleece material in half with the right side of the material on the inside. Match up the 12-inch sides so that you have a doubled-up piece that measures 12 by 7 inches. Slide the cotton sack inside the fleece sack, lining up the side seam and the raw edges of the openings. Since you'll leave the fleece sack inside-out, the right sides of the sacks will be facing each other. Pin the edges of the sacks together around the opening using the pins. This will keep the edges even and keep the side seams lined up. Sew a 1/2-inch seam around the open edge of the sacks using the sewing machine. Start at the side seam and sew around, but stop 1 inch from where you started to leave an opening through which you'll pull the sacks right side out. Remove the straight pins and trim the loose threads from the sack. Reach into the 1-inch opening you left on the edge of the sacks using your forefinger and thumb to grasp the cotton material and pull it through the opening. Pull the entire sack right side out, the cotton portion as well as the fleece part. Tug gently so you don't tear your seam. Tuck the edges of the 1-inch opening into the inside of the sack and sew it closed by hand or using the sewing machine. Trim the ends of the thread close to the material using the scissors. Push the fleece material inside the cotton material, poking your fingers into the corners to eliminate any bunching up of the material. Fold the top of the sack down, forming about a 2-inch cuff. This will help hold the sack open for your guinea pig.  Wash the cotton material before you use it to make the sack. This pre-shrinks the cotton so that your sack won't lose its shape when you wash it.  You can place a layer of batting in between the cotton and fleece materials for added insulation and warmth.  Your guinea pig shouldn't have any problems getting into her sack, but you can sew a loop of bias tape to one edge of the sack. Just fasten the loop to the side of the cage using a carabiner or a hook to hold the sack open.